I need an android app developer with java and native code experience using C or C++ to create a NoRootFirewall app. This app will support devices between API 15 and 23. The app will be able to filter data access to every system/installed application on the device via a virtual private network (VPN). The design of the app is quite simple, hence it has a tabbed layout design. So far the first tab displays data usage statistics of the device after it finish booting....this feature works very fine. 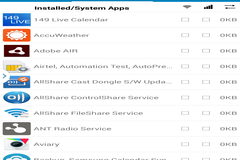 In the second tab I want the developer to display a list of all the installed/system applications from the device with their individual data usage as shown below. After the VPN is turn ON from the first tab with a switch, users can now block or allow data access to each application via checkboxes (i.e. mobile and wifi network will have different checkboxes) in the second tab. Also the applications will be listed based on the data usage amount of each application (i.e. high to low). When a user clicks any installed/system application from the list another activity should display the sent, received and its total. Also I want users to be able to assign a data limit for each application, so that once the total data reaches that limit the application will be blocked from accessing the internet. I came to your job post via linkedin. I read your project description and offering you my Android team developer's services for your project, I assure you that we will make your project successful. We wish you to see the quality of our services. We developed many Apps and delivered more than 80+ Apps & Games in iOS and Android with 100% feedback ratings from all our clients. But I am sharing few of those Apps/Games links for your quick reference. If you are looking for Mobile experts, we definitely are the right people. We always carry a positive approach and believe in challenging our own records. Our recently idea video sharing app came into the top 50 start ups. Here I want to ask you that how would you like to proceed? Please share the project description and details we can sign NDA if required. Can you please share wireframes/UI of your app so we comes to know about flow and functionality of the app. In order to provide time and cost estimation along with your requirements, it would be great to discuss your requirements in more detail over skype. More links can be shared if you want. Thankyou and I look forward to your respone.